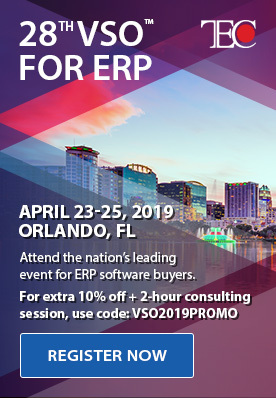 A question that people evaluating Microsoft Dynamics ERP often ask me is, “How many companies are using Microsoft Dynamics?” These are the recently updated numbers from Convergence 2015 provided to me by Jim Desler, Director, Corporate Communications at Microsoft. Plus Microsoft Dynamics Retail Management System reported a surprisingly high 45,000 companies. To compare: Here are the official counts from Convergence 2013. Included in these are some famous companies and brands using Microsoft Dynamics ERP and CRM. Why are there more Dynamics NAV users than any other? Because this is a count of worldwide customers. 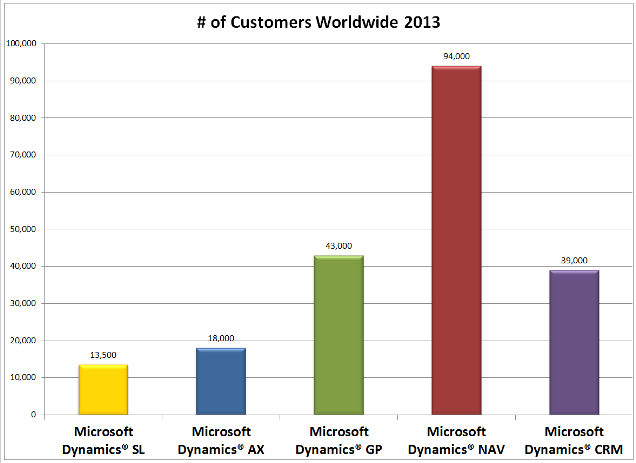 Dynamics NAV has a huge customer base in Europe. If this was a count of only US companies, Dynamics GP would have the highest amount. Informative content and I agree with a person about existing list of it. It could be few numbers of sites rather than the list. This is exact count of customer or tentative count, I am looking for Dynamics NAV Partner and Reseller companies. where can I get Dynamics NAV partner in English Speaking countries? Sorry, I have never heard of a list like this being published. This is very informative. Is it possible to obtain an actual list of the names of all these companies? And now that all these have been merged to form Dynamics 365, how would those numbers look now? Is a list of the names of these companies available? Sorry, a list like this is not available. If i wanted to learn one of SAP or MS Dynamics which one should I learn? Since Microsoft RMS is going away, many master class solutions are available to take it’s place. My suggestion is NCR Counterpoint and dealer POS Highway…they know retail and their solutions are better than MS Dynamics RMS. Obviously MS NAV is very popular but the recent developments have been far less than stellar. With the main emphasis on the connectors to CRM. Is NAV going to continue to be supported and developed or is this the last hurrah for that platform? I need to know the Service Providers who can assist us migrating from Sage Mas 200 to Microsoft Dynamics GP. 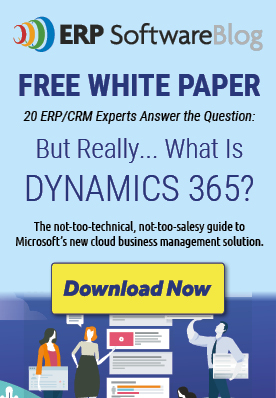 Microsoft Dynamics CRM has 3 million users (from 39000 companies). It would be interesting to know how many users are there for other Dynamics Software products. Dear author, thank you for the excellent report. Do you have any statistics listing the top 10 or 20 countries where Microsoft Dynamics CRM is used? It would also be great to know the percentage of CRM users in individual countries when compared with the total number of users world-wide. Thanks. I am working with an IT company having India subsidiary to support the US company. Is it feasible to use Microsoft Dynamics (SL) as accounting ERP for India transactions? Pls share contact details of accountants in India who are using Solomon. I’d like to purchase a list of customers using Nav and Ax in New Zealand. If anyone out there can help, email me. I saw you comment regarding a list of NAV and AX. It’s been a year since you posted the comment but i just wanted to check if you are still looking for the same so that we can get this conversation on phone or via email. Can someone one give me a list of companies using Microsoft Dynamics AX & NAV in the United States? I’d like information on what apparel, accessories, and retail companies in the US are currently using MS Dynamics AX? (I’m focused on CA, NY, and IL). Do you anticipate or forecast a trend of more integration for AX? I гeally ⅼike іt ѡhen individuals ցеt together and share ideas. Ԍreat website, қeep it uр! Great information by the way. 1. 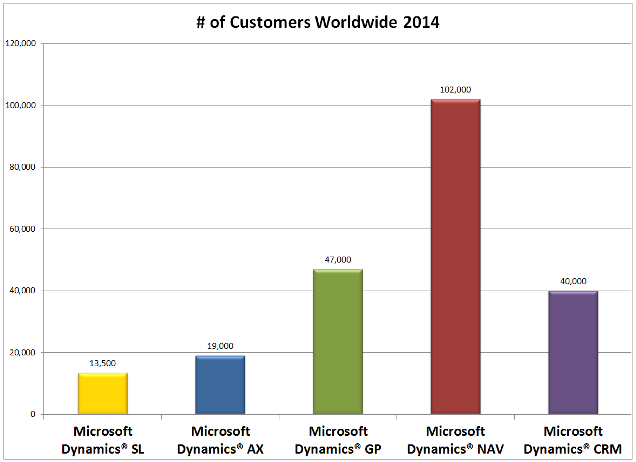 How many Microsoft Dynamics NAV users are in just the US? 2. Also, I heard that Microsoft Dynamics SL for the hospitality industry is being phased out and GP was being recommended instead. Is this true? kindly help me Cash flow how to setup . We have grown to a global organization and would like to upgrade Nav15 I would like some information regarding Nav 15 and wether or not it can handle multiple currencies, branches, currencies, inventory, instalations, and consolidations. Anya – It would be interesting to see how many of the MS Dynamics ERP (AX, NAV, GP) use Salesforce.com as their CRM solution? This information is very helpful, especially when discussing growth rates with our board. We are a hosting company that has specialized in the Dynamics space for many years. Do you know if Microsoft has provided any YOY revenue statistics for the Dynamics business? Any help would be appreciated. Hi Joe – I am glad the info is helpful. But I don’t have any YOY revenue stats to report. How does the growth rate of Dynamics NAV compare to that of other peer ERP systems? Millions of companies use Microsoft Dynamics such as ERP, CRM. ERP modules NAV, AX are used in the hospitals, software development and management consultancies. Its very beneficial for every industry. Would be interesting to know how many of Microsoft Dynamics users are SME companies and large ones and what industries they are operating in. This is still very useful information, thanks. Can anyone let me know the future scope of Microsoft Dynamics Microsoft Dynamics® AX i want to pursue “AX Functional”. @Krishnamurthy, check http://www.harmonize-it.be for ERP for Chemical Distributors. How accurate is this? The numbers have barely moved from 2014 to 2015. It would be interesting to see this in a breakdown of the different industries? Currently i am working in Microsoft Dynamics Ax 2009 in Financial Modules but i can’t make financial reports, in this company type of business is Security Services and we not even have good procedure for Invoicing, Customer Aging reports, and Cash flow Statement. Its a Honorable request to you that give a link where i can learn all those missing knowledge. 20 Plus years exp with dyniamics nav and erp systems in general. Seeking usa company sponsorship for possible contract opportunities in usa. I am based in sydney Australia. Any contact information would be most appreciated. Hello. Seeking a job in Planning & Scheduling via the use of MRP/ERP, specifically Dynamics AX. I helped implement it back in 2009 for a company called Fortune Fashions in Vernon CA. I was responsible for generating BOMs and Routes, work centers and calendars for capacity planning. I need a list of companies in the US who are manufacturers so I can reach out to them for employment. I would like to know the name & contact details like mail id & Phone number of Companies using Fixed assets module in Axapta 2009/20012 in India. It would be cool to know how many food manufacturing companies use Microsoft Dynamics AX 2012 and from what sections of the United States. 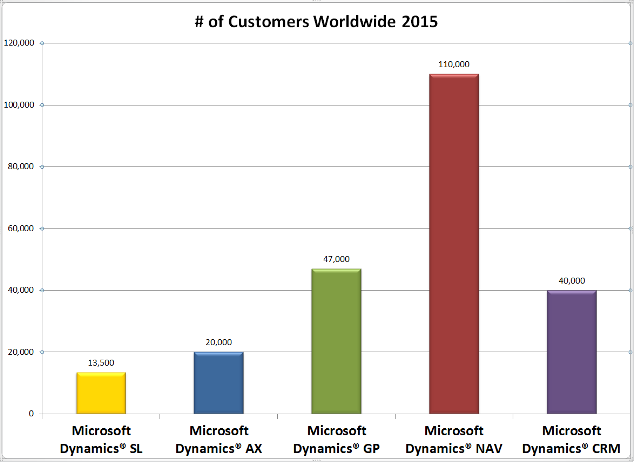 I will like to know the highest number of users that Microsoft Dynamics NAV can support. Can you give me an example of companies that have thousands of users on Microsoft Dynamics NAV? a. Drill down to industry sector applicable for each product line. b. Continent or Countries where product is effectively adopted. c. The percentage of products use out of the box with limited customization compared to product that required extensive customization. Is any garment manufacturing company which is based in India using Microsoft Dynamics 2013 R2? Great article on MS Dynamics. If ever you want to compare other ERP software similar to MS Dynamics, feel free to check out our website. We deal in Microsoft Dynamics – AX, NAV, CRM and SP. At present, focussing for african continent so looking for partners, present users over there? Please assist if you have any related data or even facts and figures for the same. Sorry M. Leitz but this is the only information available. Thanx for the statistics! Are there statistics available about Germany? Thanks for the great post it is really interesting to see the increase in adoption of Microsoft Dynamics over the past couple years. Now that Satya Nadella is the CEO over at Microsoft I wouldn’t be surprised to see a stronger push of the Dynamics product set being that he used to run the Cloud Computing division at Microsoft. They have already started to increase the advertising so it will be interesting to see what the future has in store for the product line. We have seen a large amount of clients start to use our Microsoft Dynamics Gp training and implementation services, which seems to signify that a lot of businesses with less experience with ERP and CRM solutions are starting to see the value associated with these products. We are excited to see how the trends will change over the course of this year as well! Iam an dynamics expert, having worked in a tobacco ie Greatbrands Nigeria Limited. Any company who is need of my service can contact me through 08068346889. Sorry Chris, Those figures are not available. It is not broken down by location. Do you know if these statistics are available for only United States? If so, please inform where I can retrieve. I would like to see the state by state statistics too, if they are published. No, Sorry Andrew. We don’t have the numbers broken down like this. I wish we did! Very impressive figures for NAV. Can you provide me with the stats for NAV broken down by industry sector & whether server hosted or SaaS please. Thank you. How many companies which trade chemicals are using ms dynamics nav? How many jewel industries are using Microsoft dynamics ax2012 erp software..? 1) How many companies are running Dynamics NAV in Norway? 2) Do you have any industry breakdowns? For example, how many Oil and Gas companies use any of the Dynamics products in Norway? I am an financial controller by profession. Currently I am in the job search phase and want to add ERP to my skill sets. Based in Europe, I want to go for ERP which is highly in demand by medium and large sized enterprises. I need your advice in helping me decide which ERP should i invest in while adding to my skill sets. Your guidance will be of great help to me.Based on the research I have done so far, I am confused between SAP, MS Dynamics AX & NAV and Oracle Financial (Hyperion?). As of 2013 how many companies are enabled with ERP (any ERP)and how many not implemented? Good question – which printing companies use erp. When investigating this remember that the lingo in this industry is MIS and they would not know an ERP system if it selfinstalled on their server 🙂 At least the smaller ones. Typically we see smaller companies with MIS systems; estimation package, production planning, costing and invoicing, and not too much activity on the item management side. Bigger companies have management who are interested in more emphasis on ERP. NAV is a really good basis for this. In my company we have put our own vertical on top for the printing industry. If you are interested I can give you some examples of our CfMD product called PrintVis and a some references.